For those of you who commute to work via bike and are looking for a great backpack, I would check out 1. Osprey and 2. the Osprey Radial 26. Why? 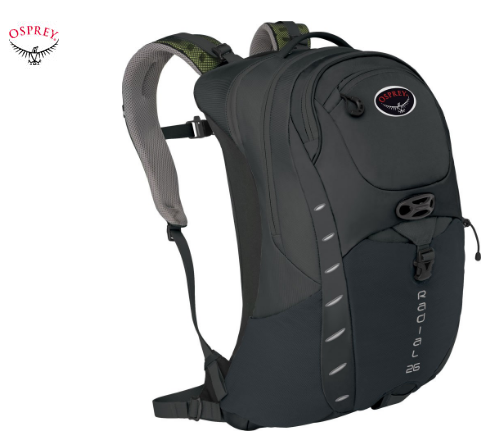 Well for starters it is a quality backpack, provides a wwater-resistantshell that tucks away on the bottom of the bag, includes two side pockets that stretch and can fit any size water bottle, a hook for keys in the front pocket, perfect for if you have a work badge that you don’t want to keep taking out and putting away, you can just clip it to the key hook. This bag is my go to and has become such a savior for commuting. It is not heavy or positioned awkwardly like regular backpacks or sits low on your back causing back pain. The bag is made with a sturdy piece of material on the bottom, designed to take the stress of wearing a backpack while you ride off of your back. It may be strange to adjust to in the beginning, but you get used to it. It also comes standard with a front pocket that stretches, perfect for your bike lock, a plastic loop for storing a helmet, adjustable straps across the chest and waistline as well as the typical straps that go over the shoulders. Each bag has two large pockets for storing items. The middle one is where I store my lunch bag, shoes and sometimes two pairs and my extra clothes for changing into at work. It also has an area to tuck items away into and more storage spots for extra water bottles or coffee travel mugs. The last pocket is perfect and cushioned for laptops. It also comes with an extra padded pocket for smaller electronic items in case you choose to use the last pocket to store your coat or any other item. This bag fits a lot and is exactly what I need for commuting to work. The best benefit, in my opinion, is the fold-away rain jacket that fits the whole back. There have been numerous times I have been caught in a sudden rainstorm and it protect all of my valuables. The new version for 2017 retails for $170 but there are many websites that offer the previous year’s version for less than $100. This is a great pack and I highly recommend it for commuters.